Lentiviral vector for use as a standard for titering experiments when trying to compare vectors with different selection markers or to determine appropriate antibiotic conditions. This lentiviral vector can be used as a standard for titering experiments when trying to compare vectors with different selection markers. It can also be used to determine if selection conditions with blasticidin or puromycin are using too high or too low a concentration of drug. If there are surviving cells that are EGFP-negative, then drug concentration is too low. If there are dying cells that express EGFP, then drug concentration is likely too high. 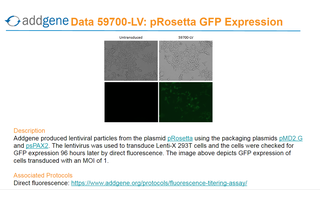 Ready-to-use Lentiviral Prep particles produced from pRosetta (#59700). In addition to the viral particles, you will also receive purified pRosetta plasmid DNA. Lentiviral particles carrying a GFP tag and both puromycin and blasticidin resistance. Direct fluorescence: Lenti-X cells were transduced with serial dilutions of 59700-LV. 96 hours later GFP-positive cells were counted. 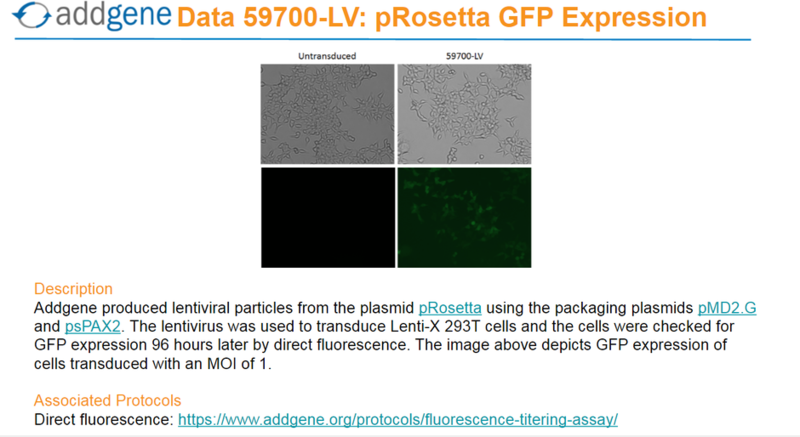 You can view GFP expression in pRosetta-transduced cells here or at the image section at the top of this page. Read our fluorescence titering assay protocol here. Colony formation: A549 cells were transduced with serial dilutions of 59700-LV and treated with blasticidin or puromycin. Blasticidin or puromycin-resistant colonies were expanded for approximately 2 weeks, stained with crystal violet, and counted. PCR confirmation of insert: PCR was carried out on the viral preparation with primers targeting the puromycin-resistance gene and the blasticidin-resistance gene. The PCR product was visualized on an agarose gel for size confirmation.